Can You Name All Six Tube Stations Named After Pubs? M@ Can You Name All Six Tube Stations Named After Pubs? Most of the stops on the tube network have names whose origins stretch back hundreds of years. Some, like Wembley Park and Kennington, recall ancient landowners or chieftains. Others, such as Burnt Oak and Woodford, recall landscape features. And then there are the tube stations named after pubs. There are six by our reckoning. 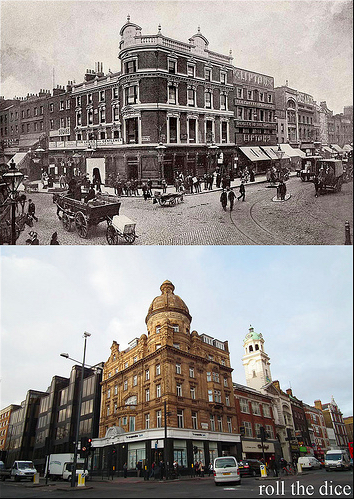 The Angel, 1890 and 2010, by Roll the Dice in the Londonist Flickr pool. The Angel coaching inn long stood on an important crossroads to the north of London. It primarily served travellers following the Great North Road, roughly speaking, the modern A1. From the mid-18th century, the Angel also found itself well placed on the New Road, now called Pentonville Road — an early bypass popular with animal drovers guiding their stock to Smithfield Market. The inn dates back to ancient times, but seems to have changed its name to the Angel around 1614. It was here, in 1790 that Thomas Paine began writing Rights of Man, one of the most influential books of all time. The Angel continued trading under different guises until well into the 20th century — the current building is from 1899. It is now a branch of the Co-Op bank. The inn lives on in the name of the tube station (opened in 1901), in a Wetherspoon pub adjacent to the original site and, of course, on the Monopoly board. Whole essays have been written on how this inner London hub got its unusual name. The commonest claim is that it is a mis-hearing of ‘Infanta de Castile’, a title associated with Iberian royalty, some of whom married into the English royal family. The most likely, and sadly most boring, solution is that an elephant with a castle on top was a common motif in medieval days — it was, and remains, part of the emblem of the Cutlers Company, for example. A tavern called the Elephant and Castle was present at this junction at least 250 years ago. The owner may have chosen the name through some association with the Cutlers, or for purely whimsical reasons. Whatever the case, the name long predates the opening of the two eponymous stations, which appeared in 1862 (rail) and 1890 (tube). 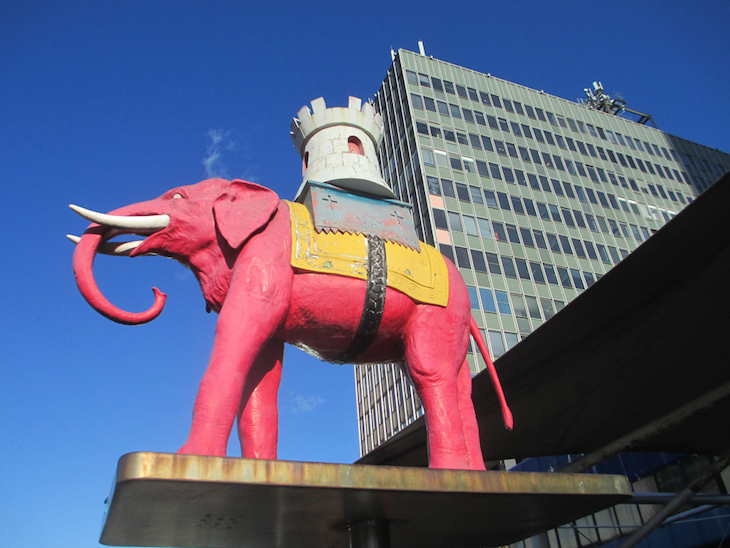 The area is now commonly called Elephant and Castle (or just The Elephant), but it was also traditionally known as Newington. The Elephant and Castle pub — a 1960s rebuild — had closed down, feared lost, until a local campaign saw it reopen as part of the Antic chain. This attractive Bakerloo stop and the wider area take their names from the Hero of Maida pub, which stood by the Regent's Canal on Edgware Road from around 1809. Its unusual name commemorates General Sir John Stuart, victor of the Battle of Maida in 1806. It closed in the early 1990s. Today, the building is a skincare clinic. 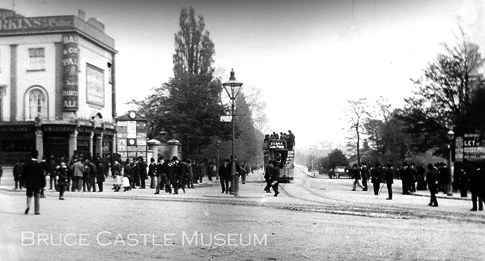 The original Manor House pub in 1905, looking along Seven Sisters Road. Image public domain. Perhaps the least guessable of the six. The Manor House inn was a well-known stop along the Green Lanes turnpike, perhaps named after the local manor house of Brownswood. It opened at the start of the 19th century and had a distinguished history. Queen Victoria is thought to have stopped here during a journey in 1843. In the 20th century it became a music venue, hosting the likes of Rod Stewart, Fleetwood Mac and Jimi Hendrix. Today, the building is an organic cafe and supermarket. The Piccadilly line station opened in 1932, taking its name from the then-thriving pub. One little-known fact about Manor House tube station: in 1933, shortly after the station opened, the Prince of Wales and future Edward VIII, drove a train for the two miles between this station and Wood Green. This relatively quiet tube station north of Bayswater shares its title with one of England's commonest pub names. The original Royal Oak was a tree in Boscobel, Shropshire, which served as a hiding place for the future Charles II while fleeing the Roundheads. After Charles gained the throne, many pubs took on the name of The Royal Oak in commemoration, and it remains the third most popular appellation in England. The one in west London gave its name to the tube station in 1871. It is still going strong, though sadly rebranded as The Porchester. The present Ye Olde Swiss Cottage. Image under Creative Commons licence by Oxyman. In 1840, a brief fashion for all things Helvetian saw the building of a Swiss-style inn out in the fields north of London. 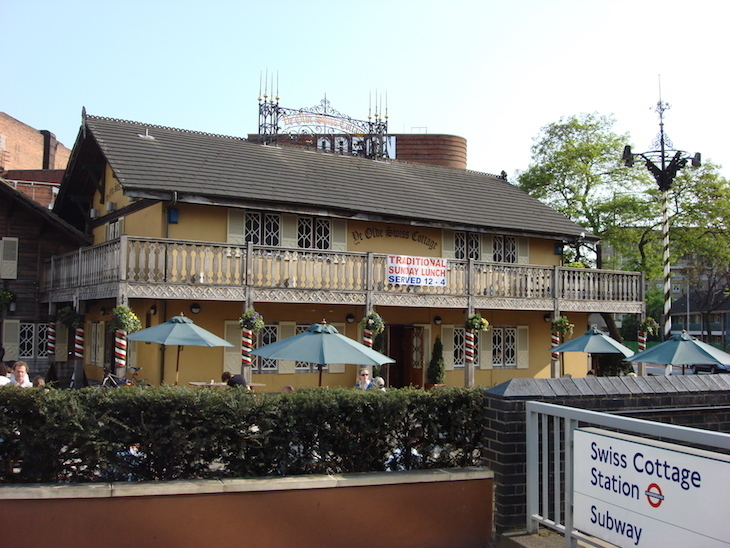 Known as the Swiss Tavern, it served as a coaching inn on the newly built Finchley Road. It became a well known landmark, eventually giving its name to a tube station and the wider area. A much-rebuilt version of the tavern still stands as the northern-most Sam Smith's pub in the capital. Read a more detailed history in our recent article. Bull and Bush on Hampstead Heath would have been the capital's deepest tube station, and seventh to be named after a pub. Although significant work was done at platform level, the Northern line stop was never completed, and it remains one of London's least known 'ghost stations'. The namesake Old Bull and Bush is still trading, and very pleasant it is too. New Cross is thought to be named after a coaching inn. The area was formerly known as Hatcham, but slowly changed to New Cross from the 17th century, after the prominent Golden Cross inn (near the site of today's New Cross Inn). While its two eponymous stations were formerly on the tube network, they are now classed as part of the Overground system, so miss out on being in the main list through a technicality.